Every August, the same things happens. I suddenly realize that summer is winding down. Fall is right around the corner. And then I freak out. Yes, I freak out about not eating enough corn. Hush! Corn is delicious! So like clockwork, that happened this month. I realized I haven’t taken advantage of watermelon being in season and that I haven’t made any ice cream. And really, you can never eat enough corn, can you? Obviously, I had to remedy this! I made a corn salad and then I decided to kill two birds with one stone and make Ginger Watermelon Italian Ice in my ice cream maker. I first discovered the ginger-watermelon combination when I had the idea to use ginger syrup to sweeten underripe watermelon. In general, I’m a big fan of adding ginger to just about anything. I love the spiciness and, being prone to migraine-related motion sickness and nausea, I love the fact that ginger calms my stomach too. (Do you get car sick? Try ginger gum or chews. The stronger the better.) Ginger gives the sweet, mild flavor of watermelon a little bit of a kick. The nice thing about this watermelon Italian ice recipe is that it’s easily adaptable. Do you have a lot of mint growing in the garden? Add that to the syrup instead of ginger. Basil will work well too. Use plain simple syrup and add the zest from a lemon or lime or two for a more citrusy flavor. 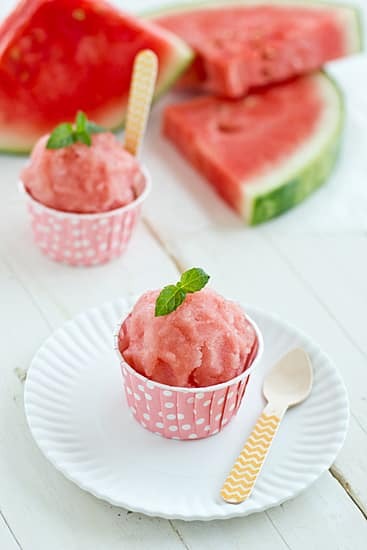 A refreshing Italian ice made with fresh watermelon and ginger. Adapted from Watermelon Sorbetto from The Ciao Bella Book of Gelato & Sorbetto by F.W. Pearce & Danilo Zecchini. Combine water, sugar, and ginger in a medium saucepan over medium-high heat, stirring often. Once syrup comes to a boil, reduce heat to low; simmer for 10 minutes. Remove from heat and allow to cool. The longer you allow the mixture to cool, the more ginger-y the Italian ice will be. Discard ginger or use it to make candied ginger. Puree syrup, watermelon, and lemon juice in blender or food processor. 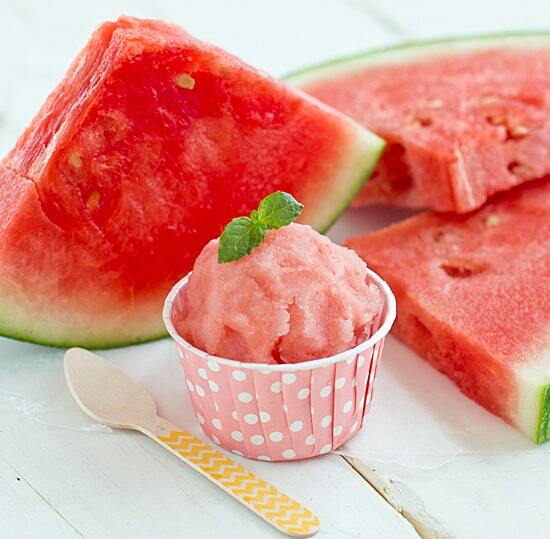 Refrigerate watermelon mixture for about an hour (you can leave it right in the blender jar or food processor bowl). Pour watermelon mixture into ice cream maker and churn according to manufacturer’s instructions. Transfer to airtight container and freeze for about 2 hours before serving. What I Ate This Week | We all need a mug brownie sometimes. Free Printable Freezer Labels For All Your Freezing Needs! I’m positive that the ginger would make me love that even more. Ginger makes me happy. Looks delish! Do you ever buy Blenheim Ginger Ale? (Have we discussed this before?) It is the gingeriest (it’s a word!) thing in existence. I make a cranberry sauce with it–so good! So gingery! Super cute cups for the ice! Corn freak-out! I could really eat it everyday but it goes bad so quickly once you get it home. So we have it once a week, at most. Sad! I do the same thing. I start to panic when the farmers market start to thin out of my favorite produce, like apricots that you pretty much can’t get out of season. I love this granita! And I love that it’s dairy free. We’re lucky to have a long growing season here, but I found myself freaking out ever-so-slightly when I went to the farmers market this weekend and all the booths were starting to have fall veggies alongside the summer ones. I freak out the same way. Not enough summer produce in my belly!!! Oh good, I’m glad I’m not the only one who goes into a summer produce-related panic every August. Summer goes by too fast! So pretty and yummy, Kiersten! I’m having a similar freak-out right now .. Especially with every other blogger talking about Fall foods already when there are still so many summer foods I need to eat more of! I know, all the booths at the farmers market here are starting to sell fall veggies now. Too soon! Another delightful recipe, another day that I wish I were your neighbor. This looks divine. I am going to buy an icecream maker this week. And ginger also helps clear skin from what I hear. So a great food habit to start with children before they hit their teens. It took me so long to finally get an ice cream maker and I don’t use it all the time, but when I do use it, I’m so glad I have it! LOL! I do the same thing every year too! And I’ve just started doing it for this year. Too funny. What a great idea for a cold treat 🙂 And I love the color of it! Oh could this look anymore refreshing!? Really this just looks awesome!! An ice cream maker is now on my wish list! This looks so good – I can’t wait to try it! You keep posting these kind of photos and my monitor will soon be completely clean…one lick at a time. WOW that looks good! I was really worried I’d have to take photos of this recipe a second time. Anything frozen is so hard to photograph! This looks so lovely! I like the addition of ginger. That looks so refreshing! I love adding ginger to everything too, but I’ve never tried it with watermelon. I love how watermelon can pair so well with spicy or strong flavours though, so I bet the ginger works really well in this recipe! Also, I’ve definitely started to feel the pressure in getting enough use of summer produce before its gone – I haven’t had my share of local corn or garden tomatoes yet! I’m definitely making some corn recipes this weekend! Unfortunately, local corn hasn’t been very good this year because we’ve had a lack of rain. But I’ll take what I can get! Oh me definitely want some! Oh my!! I loooooove Ginger and I love Watermelon! I can’t wait to make this. Or attempt to make it hehe. yum! that looks like a perfect summer treat! I’m in love with the spoons and paper cups! SO cute. I am exactly the same about summer. I practically hiss when teacher and parent friends talk about kids going back to school, or when my Austen book club starts planning the Christmas party in August. I’ve eaten plenty of watermelon and corn this summer, fortunately, but I always miss them so much come fall and the long winter. This ice looks amazing! But you can never eat enough watermelon or corn! Never! You can probably make this without an ice cream maker too. Cut up watermelon and put it in a zip-loc bag in the freezer. Make sure the sugar/water/ginger mixture has cooled completely. Add all ingredients in blender. You might have to play around with the proportions to get the right consistency. Or you can have a wonderful smoothie too! Sounds delicious! Water melon is in season in South Africa and I can’t wait to try it! Is there a possibility of replacing the sugar with something more natural?